Alan Davey will need no introduction to readers of Aural Innovations. As bass player and keyboardist for Hawkwind he’s been a mainstay of the band for well over twenty years. His song-writing and composing credits with Hawkwind include the highly popular ‘Sputnik Stan’, ‘Sword of the East’, ‘Sunray’, ‘Blue Shift’ and ‘L.S.D’ to name but a few. Outside of the Hawks, Alan is best known for his solo albums, including Captured Rotation and Chaos Delight as well as his former side-project Bedouin, once described as a psychedelic Motorhead with Arabic overtones. More recently he’s been involved as bassist and producer for the highly acclaimed Pre-Med album Medication Time (Voiceprint Records, 2006) and again as bassist with Death Metal band The Meads of Asphodel. His latest solo album, Human on the Outside has just been issued on his own label, whilst plans are also afoot to raid his archive of demos for a set of releases and a second Pre-Med album is in the pipeline. With Voiceprint Records having issued remastered editions of his earlier work, and his new material attracting highly favourable commentary, Hawkwind biographer Ian Abrahams caught up with Alan to get an overview of these exciting projects. Aural Innovations (AI): I’m interested in how you work as a solo artist, because clearly that’s a different environment from working in a band situation? Alan Davey (AD): I tend to be a fairly chaotic writer. I very rarely sit down and write a song, I normally just fiddle about with keyboards, guitar or bass until something pops out – a nice little riff, a harmony or a melody line and then I’ll build the entire song around that. I mainly write on the keyboards, finding interesting or unusual inversions. Often I’ll just be walking around or doing whatever I’m doing and a tune will just pop into my head and I’ll write it down and work on it at home. AI: Do you have to rent studio time or are you, like Dave Brock, set-up to work from home? AD: I’ve got a room where I live that has a nice ‘dead’ sound in it. It’s an old cottage so it’s not square or anything, its got natural alcoves where I can put the speakers and there’s a place in the room where I’ll know if there’s too much bottom-end on a song because it’ll exaggerate it. It’s a good room to create music in and I’ve got to know it pretty well over the years. I’m using a PC studio programme to record on, rather than a giant mixing desk, and have lots of gadgets to play around on and experiment with. AI: So working away from Hawkwind on your own stuff, do you treat that as a sort of 9-5 job or wait for the creative impulse to strike? AD: Some days I’m just not in the mood for it! But then again I tend to work very fast, so if I’m not in that mode I tend not to bother because I know that when I’m ready to work I’ll get really fired up with ideas and really get on with it. AI: Is there a distinction between working on material for Hawkwind and your own solo albums … do you get up and think ‘today’s a Hawkwind day’ or ‘this morning is Alan Davey time’? AD: If I’ve got something that I think would be good in Hawkwind I’ll take it down and play it to Dave. If it gets rejected it becomes a solo work; some of those ideas became the Captured Rotation solo album. I thought tracks like ‘Ancient Light’ and ‘The Call’ would be really good Hawkwind numbers, but for some reason they didn’t make it there, so I started working on them by myself. The last couple of years, because I’ve had this extra technology to try out pretty much anything I want, the work has became slightly differently and doesn’t sound so much like Hawkwind songs. 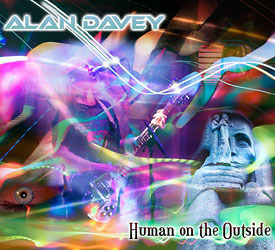 I write “Alan Davey” songs that suit how I want to sound at the moment – my own style and individual tones. AI: Do you see yourself principally as a composer or as a songwriter? Ad: The lyrics are hardest part of the process, because I’m dyslexic. I’ll get a couple of good lines that’ll pop into my head, but actually sitting down and writing lyrics is difficult and I have to be disciplined about that, really concentrate on it. When I’ve got a deadline – that’s when I can use the pressure to come up with lyrics, and then I’ll do all the vocals in one day! AI: You’ve sometimes used colleagues and friends on your solo work, as with Captured Rotation. Has that practice continued with the new album Human on the Outside? AD: Ron [Tree] used to stay here sometimes when he was in Hawkwind, so rather than sitting around doing nothing we’d work on some music. But on the new album, Isobel from Bruise, a band that has supported Hawkwind a few times, wrote the lyrics for ‘Drum Head’ and ‘Nothing is Weird’ and sings on them. Danny Faulkner, from Pre-Med, has done a spoken piece on one called ‘The Unseen’ and Metatron from Meads of Asphodel has done ‘Glass Wolves’. I’ve done four or five of the others, I’ve done a lot of instrumental work in the past but this one is principally an album of songs. AI: Can you give us a flavour of some of the new tracks? AD: The album opens with ‘Atmosphere’ which, appropriately, is a very atmospheric track! Really sets the mood, again it’s having the facility to widen-out the sound with different delays and a good stereo spread to make it really big. Then there’s ‘Dog Star’, which is really unusual because all the notes on it shouldn’t work together, it should sound horrible! I composed it using midi-information where you can assign sounds … I put it through a piano and it was awful, like Les Dawson [a late British comedian who made a regular joke of playing piano badly] on two bottles of whisky! But with the sounds I’ve picked, it’s become very melodic – which is quite strange! I’m not entirely sure how that piece works, I’ll have to go back and find out! AD: Yeah, like ‘Drum Head’, which was really an experiment with drumming. I had five samples of drum kits going at the same time, just for laugh really. But once I’d EQ’d them all up so that they didn’t rumble or clash with each and sounded nice and tight, the riff that I was playing over them, on lead guitar and bass, was also being played by the drumheads themselves. Mixing these drums together made the riff, and once I had that pulled together I heard in my mind a woman’s voice singing on it. So over about the space of a year I was looking around locally and checking out any bands that had a female vocalist and in the end the idea of using Isobel from Bruise came up. And she was just perfect for it and did exactly what I wanted on it. But it’s funny how the riff came out of the mixing on the drum samples, I’d never done that before but it’s worth experimenting that way again. AI: Any other tracks that are outside of what we’d normally expect from you? AD: Glass Wolves, which Metatron sings on, is a big, chunky, riff with a really dark horror-movie soundtrack feel to it. It’s quite an unusual track for me, actually. Metatron wrote the lyrics, which are about all our leaders lying to us, failing us, and not having anyone to believe in any more. The people we should be able to look up to, they’re all crooks and liars. We’re sheep amongst glass wolves actually. They’re really good lyrics. Musically, I guess the closest thing to compare it to, if you look at Hawkwind, is ‘Angels of Death’ but this is a lot heavier, more intense. AI: One of the tracks, ‘Delusions of Ganja’ has been made available on your Myspace page as a taster for the album, tell us about that one? AD: It’s a dyslexic play on words, of course! I probably said it wrong one day and thought ‘Ah – that sounds good’. The lyrics are about knowing where you are. If you smoke Ganja it can take you away from the point where you should be, you’ve really got to remain yourself but some people smoke so much of it they’ll loose themselves. It started as a keyboard piece with the intro, but when I listened back I started hearing drums on it and so I got them together and it built up from that. Friends have said the bass-playing on it isn’t like me, not as “pumping” as I’d normally be. But there is some pumping bass on the album – it wouldn’t be me otherwise! AD: I really layered-up the sound, there’s three or four keyboards playing the same part to make this really big, wide, lush sound. But then, it’s recorded on a twenty-four track rather than an eight track so the whole album has this lusher sound simply because I’ve got the equipment to achieve that. AI: It seems highly cinematic in a way, could you see yourself making the transition into composing for film? AD: I’ve been told a lot of times that the music I compose would be fantastic for everything from wildlife documentaries to horror films! I’d really like to get into that, because I tend to mix rock music with cinematic soundtracks and make the two things work together, but then I’m a bit of a movie buff. If I write a really heavy rock song I still like to have a textured atmosphere mingling around in the background to give it a bit of an edge. AI: There’s a bit of a small-screen influence as well in your work, isn’t there? I remember you doing a cover of the theme from the Gerry Anderson UFO series a few years back. AD: Well, I used to love that programme when I was a kid – the alien ships and the whole sound of it and all that stuff influenced me. So when I did Chaos Delight for Black Widow records in Italy, it became a bit of a sci-fi soundtrack album with a rather heavy cover of the UFO theme. I realised that the theme was only about one minute twenty long so I made up a middle section of little clips and riffs that they’d used in the programme and it came out really well. 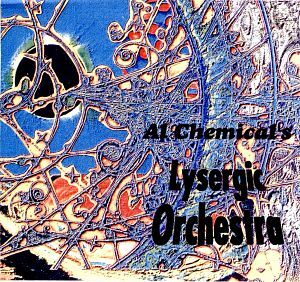 AI: You’ve co-produced Hawkwind albums, and did the arrangements and production on the critically acclaimed Pre-Med CD Medication Time. I guess Human on the Outside is also produced by you, is this another avenue for the future? AD: Yes, I produced the new album myself at home. But I also really enjoy producing other people’s music, like working on Danny’s material for Pre-Med, and that’s an avenue I’d particularly like to explore further. With your own work, you know exactly what you want to achieve, whereas working on other people’s you have to think differently and I find that an exciting challenge. I want to get into doing more of that. AI: Voiceprint has reissued some of your earlier work, Captured Rotation and Bedouin - plus the Bedouin: Extremely Live 2003 album – did you get involved with the remastering? AD: I didn’t actually do any work on re-mastering those, Rob [Ayling] at Voiceprint has his own guy who has the experience to do that; mastering is really a very different kettle of fish. I got Paul Cobbold to master Human on the Outside for me, which was great. When you’ve got work that you’re really happy with, the last thing you want is have someone you don’t know mess it about at mastering stage which is why I took it to Paul. He has a really good ear and has done a terrific job with it. 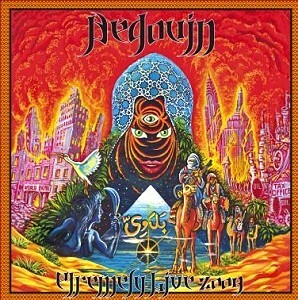 AI: It’s good to get that live Bedouin album out, it has a really raw and earthy quality to it. AI: What other things have you got in the pipeline? AD: Well, I was going through some of the tapes from my days with the band Gunslinger, which was a pre-Hawkwind thing I did with my cousin, Nigel Potter. Listening to them, I thought it was such a shame they weren’t more widely available because the songs are still relevant now. We were doing stuff that was way ahead of its time. Nigel wrote most of the numbers and he’s a really good songwriter, I enjoyed playing bass on his stuff. So we’ve made plans to start recording a proper Gunslinger album, over the Internet, swapping WAV files back and forth. We’ve got about ten to twelve songs and I’m really excited because these are the songs that I learned to play on, when I was about seventeen. AI: You nearly broke into the music business with Gunslinger rather than Hawkwind didn’t you? AD: Yeah, we did a four-track demo for a competition run by a label in Newcastle, sent it up and got chosen immediately. We won the competition and got awarded a contract but our drummer dropped out and we couldn’t find another to replace him in time so they ended up going with a band called Raven instead. AI: So what else is hiding away in your vaults? AD: Over the last couple of years I’ve had quite a few people asking if I’ve got any more copies of the ‘Elf’ EP, fans seem to really like it, and then they ask if there’s any more stuff like it, four-track demos. Well, I’ve got about twelve cassette tapes full of stuff … so I went through them and ended up with seven volumes at about forty minutes each. I couldn’t believe it! I hadn’t heard them in such a long time, and they’re all nice pieces so I’m going to start issuing them after Human on the Outside. I thought of calling them Four-Track Mind and I’ll promote them through the website in the fullness of time. Because they’re four-track demos, there’s room for some lead guitar, keyboards or singing, even bass guitar on a few. I’m going to run a competition on them so that anyone out there who has the facility to make a WAV file can add their own bits to a track and send it in. Then whoever I pick as having added the best contribution to a track will get all seven volumes free – or a refund if they’ve already paid for the set. We’ll mix the best one and include it on the seventh volume. I hope this idea will excite people!